Three minutes to go. The score: 3-3. Welsh hopes of the Triple Crown after 39 years were fading. Ireland heeled on their own 25. Jackie Kyle was bound to clear to touch. But Ray Cale pounced round the scrum to harass Carroll. As the scrum half desperately shovelled the ball out to Kyle, Cale went with it. What a fearsome combination for even a fly half of Kyle's quality: a bad pass and a deadly tackler at the same time. The ball rolled loose, but at least Kyle was spared to become a missionary in Africa. Cleaver picked up and fed Lewis Jones: the winning try was taking shape. Lewis Jones, in his new position of centre, drew full back Norton and sent a long pass swinging out to Malcolm Thomas. There were 15 yards to go as the Welsh wing threw back his head and ran for the Triple Crown. Corner-flaggers streamed across like a cloud of locusts. They hit Thomas as he dived for the corner. Down everyone crashed, corner flag and all. Was it a try? 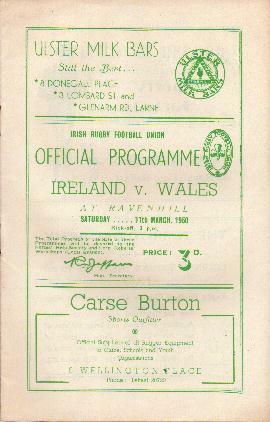 There were agonising hour- long seconds before referee R A Beattie (Scotland) raised his arm and Wales had won. 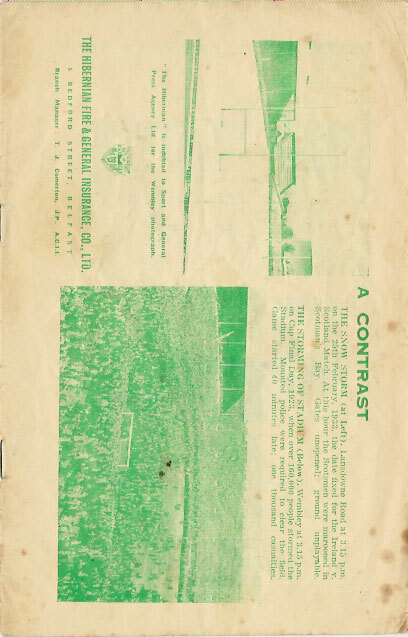 If Irish touch judge Ossie Glasgow had signalled that Thomas had knocked down the flag before grounding the ball there would have been few Welsh protests. It was a marginal decision either way. There was no score in the first half. Then a Ken Jones try was cancelled out by George Norton's penalty goal. It was a tough baptism for new Welsh full back Gerwyn Williams, but he went on to win 13 caps. 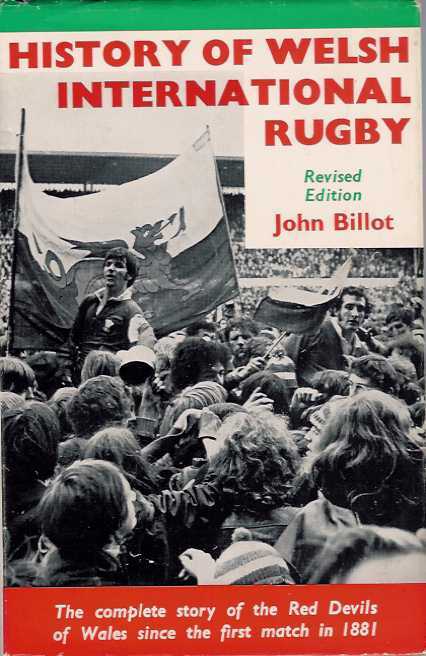 The jubilation ended on Sunday morning, when a Tudor V aircraft crashed at Llandow, near Cardiff; and 80 Welsh rugby fans died in the worst civil air disaster in history up to that time. It was a shadow across the first Triple Crown triumph since 1911. So for the eighth time Wales had won the honour. Ireland: G W Norton (Bective); NI Lane (Univ. 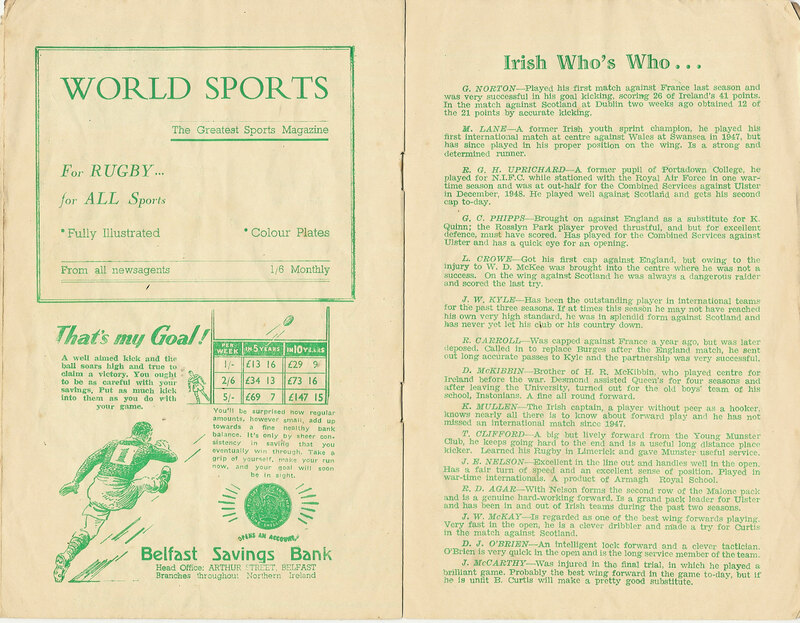 Coll., Cork), R J H Uprichard (RAF), G C Phipps (Rosslyn Park), L Crowe (Old Belvedere); JW Kyle (Queen's Univ., Belfast), R Carroll (Lansdowne); T Clifford (Young Munster), K D Mullen (Old Belvedere, capt. 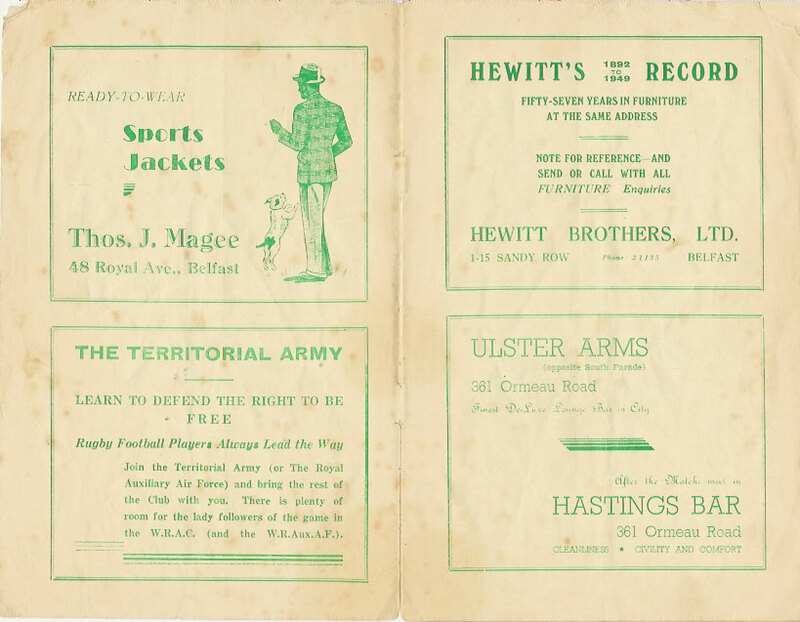 ), D McKibbin (Queen's Univ., Belfast), J E Nelson, R Agar (Malone), J W McKay (Queen's Univ., Belfast), D J O'Brien (London Irish), J S McCarthy (Dolphin). 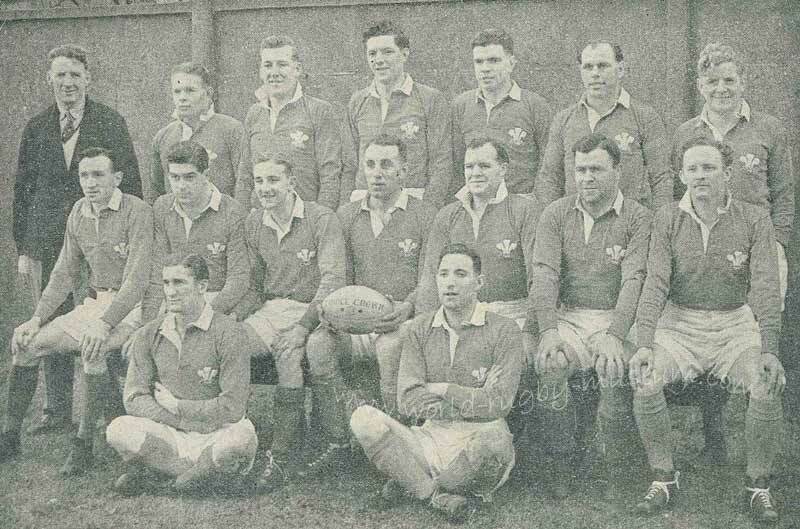 Wales: *Gerwyn Williams (London Welsh); K J Jones (Newport), Lewis Jones (Devonport Services), J Matthews (Cardiff), M C Thomas (Devonport Services); W B Cleaver, W R Willis (Cardiff); J D Robins (Birkenhead Park), D M Davies (Somerset Police), Cliff Davies (Cardiff), Roy John (Neath), Don Hayward (Newbridge), W R Cale (Pontypool), J A Gwilliam (Edinburgh Wands., capt. ), R T Evans (Newport). 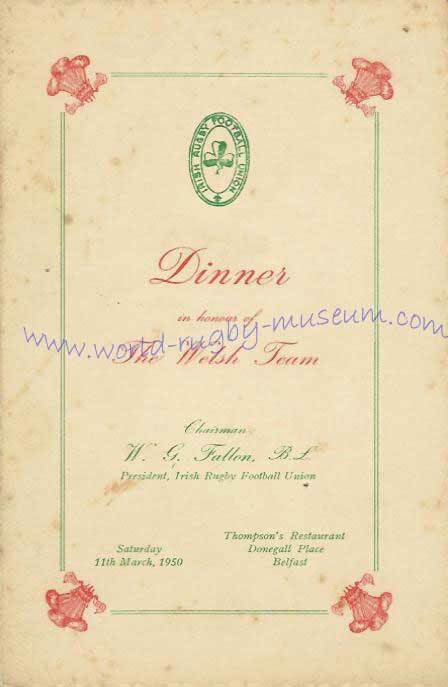 This autographed dinner menu is for the post match function held at Thompson's Restaurant in Belfast. 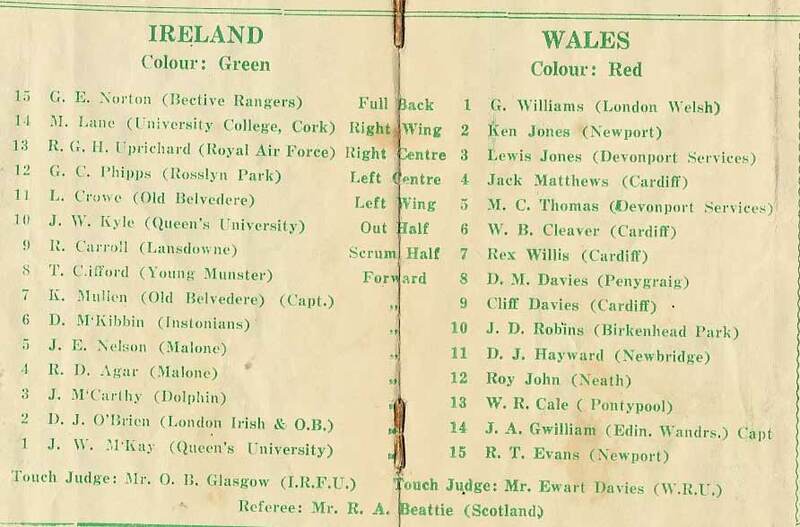 This is the personal copy of Ivor Jones (1930 British Lions, 16 Welsh caps, WRU President 1968/9) who was a selector at the time. 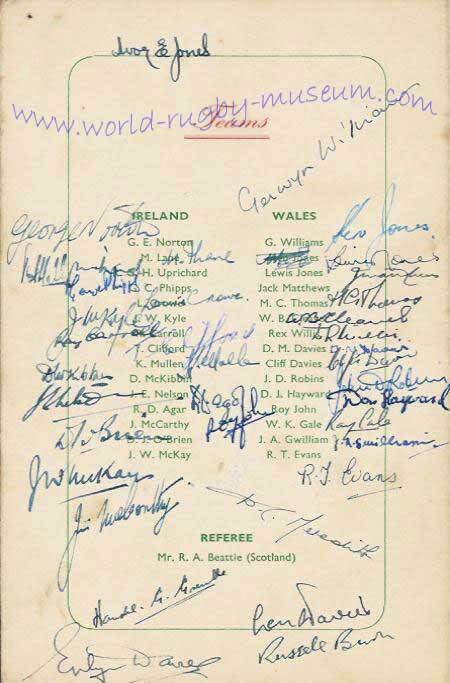 His autograph appears on the top of the back cover, it is also autographed by both sides and 5 other players/officials. This Triple Crown sweater was awarded to scrum half Rex Willis. 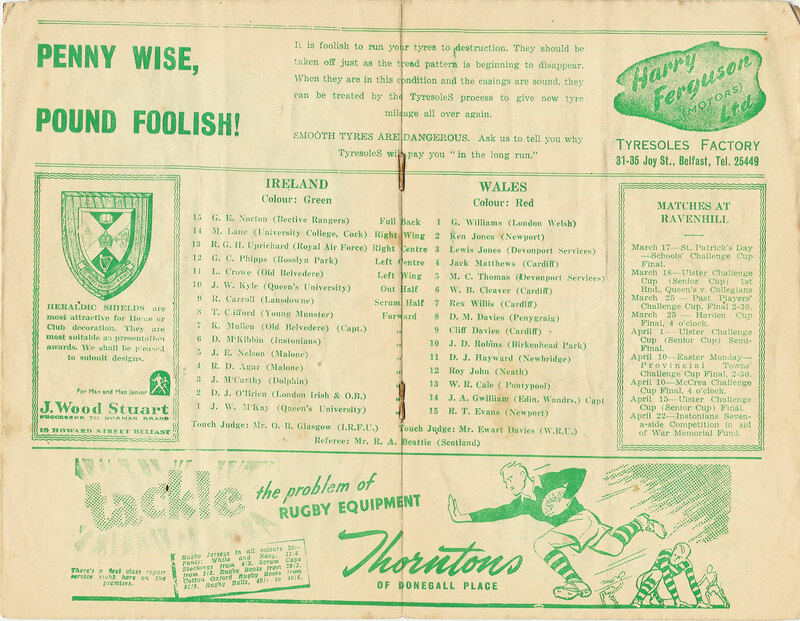 The Cardiff man played his first international against England at the beginning of the 1950 Grand Slam season. He went on to win a further 20 caps, captaining the side on two occasions. 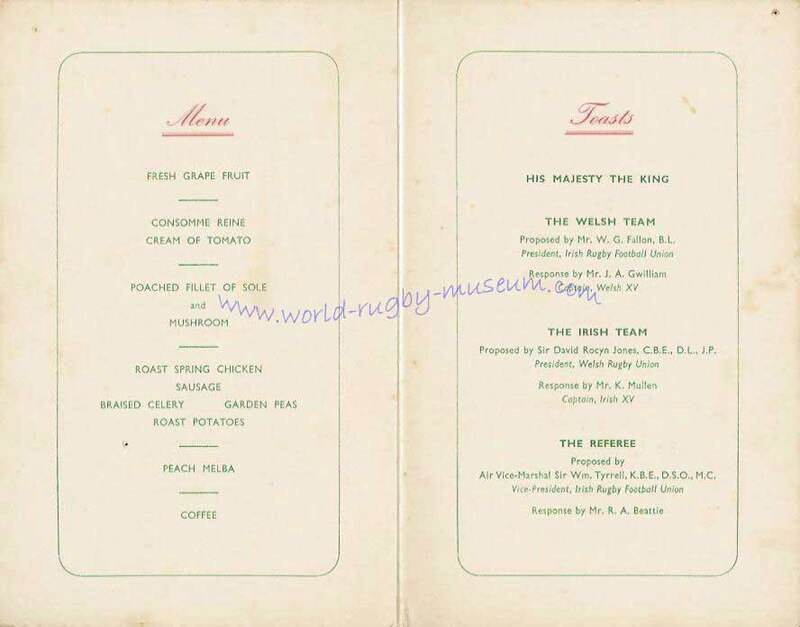 He toured New Zealand & Australia with the 1950 British Lions playing a test match against both the All Blacks and Wallabies. 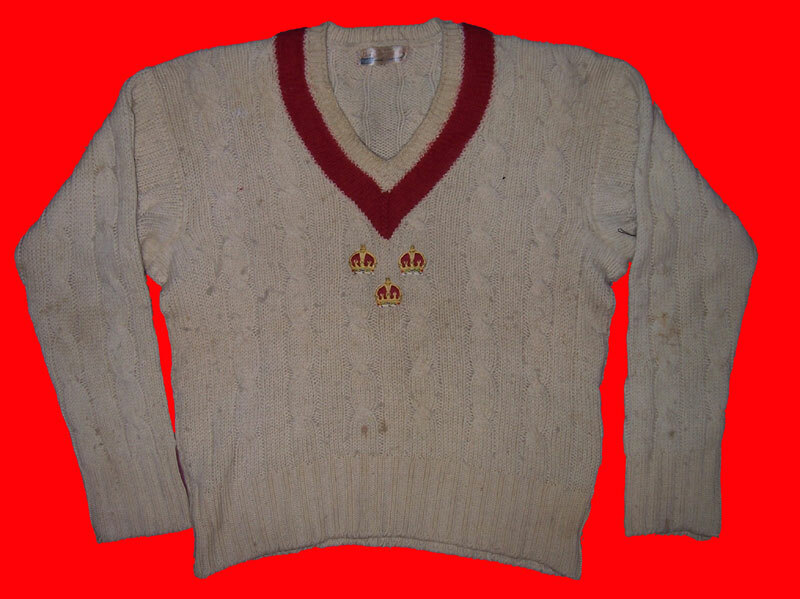 It is not known which triple crown this sweater was awarded for, either 1950 or 1952. Willis played in all 4 of the 1950 matches and two from the 1952 Grand Slam. 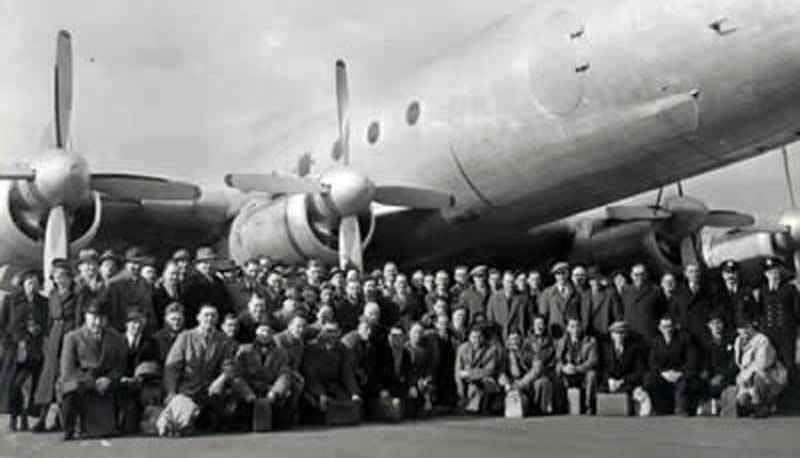 It was on the 12th March 1950 that the hearts of the Llanharan and Abercarn Rugby Football Clubs were ripped out on a bright, sunlit afternoon when an AVRO-TUDOR V plane carrying 78 Welsh rugby fans and five crew crashed into a field near Llandow in the Vale of Glamorgan. 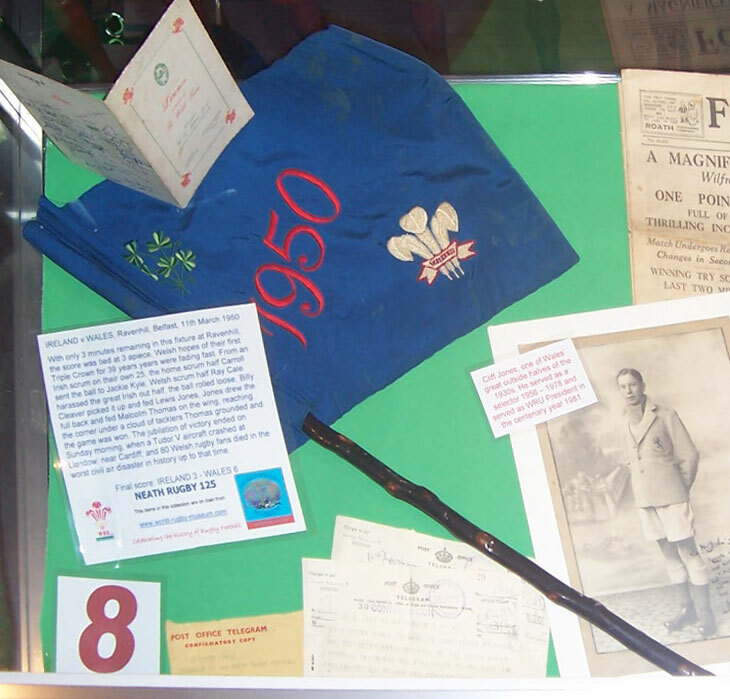 The plane was packed with supporters fresh from celebrating a 6-3 victory over Ireland in Belfast, which had given Wales their first Triple Crown for 39 years and their eighth in all. Of the 83 people on board only three survived and numbered among the many dead were five members of the Llanharan rugby team including Henry Pascoe, nephew of former Welsh international forward Dan Pascoe of Bridgend. Seven were women, including the wife of one of the Llanharan players who perished, and the air hostess. The Abercarn club badge now has a propeller on it to denote the tragic loss of its captain, baggage man and another player. The propeller is alongside the Prince of Wales feathers, which commemorate the Prince of Wales mining tragedy years before. 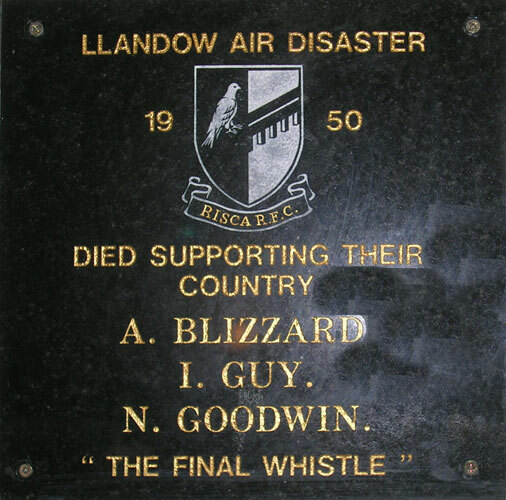 The Llanharan crest also has a black cross in it to commemorate the six players who lost their lives. Mel Thomas, another playing member of the club, was one of the survivors who was found in a critical condition. Recalling the events of that day continue to bring sadness and emotion to the face of the 73-year-old, who played at centre or wing during his days with the club. "I don't like talking about the crash because it brings back too many bad memories," he said. "I lost six mates that day"
The crash, which at the time was the worst in the history of civil aviation, happened just 60 yards from the outskirts of the Llandow (Glamorgan) aerodrome which was used for civil flights long before facilities were developed at Rhoose Airport. Nearly half the passengers came from the Western and Eastern Valleys of Monmouthshire. Abercarn RFC were also hard hit when they lost their captain Don Rowlands, coach Ray Box and star centre Doug Burnett who was the brother of Roy the Newport and Wales outside half. Another casualty was the Abercarn kit-man Albert Robbins. Burnett's elder brother, Ivor, was also a member of the Abercarn Rugby Club but he had decided not to go on that fateful trip. Skipper Don Rowlands had been an air gunner during the war and spent four years solid flying. He didn't really want to go but, fatefully, was persuaded to do so. The trip from the Greenhouse pub, in Llantarnam, was arranged by Squadron Leader Bill Irving. He had been shot down in North Africa , survived Dunkirk and done two tours fIying Lancaster bombers on 63 missions. There is a memorial to him at St Hilda's Church, Griffithstown; there is now a memorial at the site of the crash in Sigginston and there are plaques at both Llanharan and Abercarn clubhouses; Nantpennar Working Men's Club also has a tribute to the Abercarn boys. Two other survivors were Handel Rogers and "Gwyn Anthony, who were brothers-in-law from Llanelli. 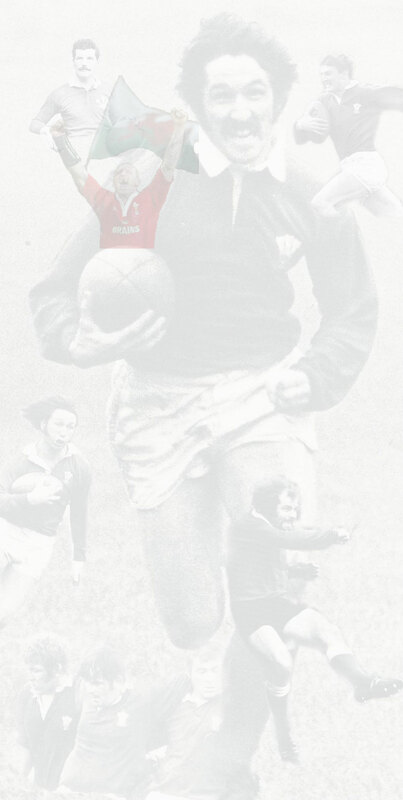 They were also taken to the Services Hospital at St Athan where they were given immediate medical assistance Handel Rogers went on to become a great servant of Llanelli Rugby Club and, in 1976, became President of the Welsh Rugby Union. Only he, and Mel Thomas, survive today from the crash. PC 578 John Davies was first on the scene, he had been waiting at the airfield for the return of the plane, after viewing the crash he phoned the local station then cycled to the crash site. He found a scene of indescribable chaos. The front part of the plane was stuck in the ground. The central section was a wreck with both wings ripped off and the fuselage completely destroyed, but the tail, although damaged, was still intact. The bulk of the 78 passengers and 5 crew were huddled in a mass in the fore part of the wreckage. Most were still strapped in their seats, which had been ripped away from their moorings by the force of the impact, and piled in a mass among the dead and injured. 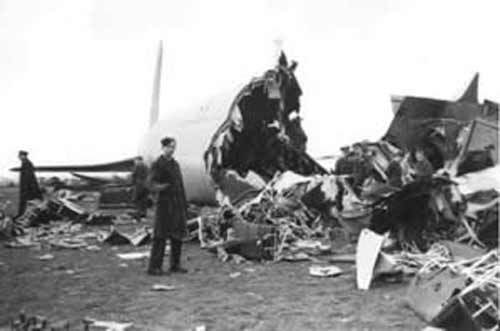 As dawn broke the next morning the tail and wrecked fuselage of the Avro-Tudor V stood out in sombre silhouette over the crash scene. Air Vice-Marshall Donald 'Pathfinder' Bennett, managing-director of Fairflight Ltd, the owners of the plane, was among the first visitors to survey the scene along with accident investigation officers of the Ministry of Civil Aviation. The giant Brabazon aircraft based at Bristol flew over the South Wales crash area on the morning after the accident and dipped its massive wings in a salute to those who perished. It appears from witness accounts that the plane made a normal approach to the runway but the pilot then revved the engines, made a steep climb and another circuit. When it made a second approach, a wing hit the ground and the main fuselage broke up leaving only the tail intact. There were 44 police officers and 42 ambulances on site. The local bobby cut a pathway through the hedgerows to allow the emergency service vehicles through and the Salvation Army were soon on the scene offering invaluable support. The reason for the crash was never pinpointed, pilot error being the most logical, however a contributory factor could have been improper loading of the plane which shifted the centre of gravity. 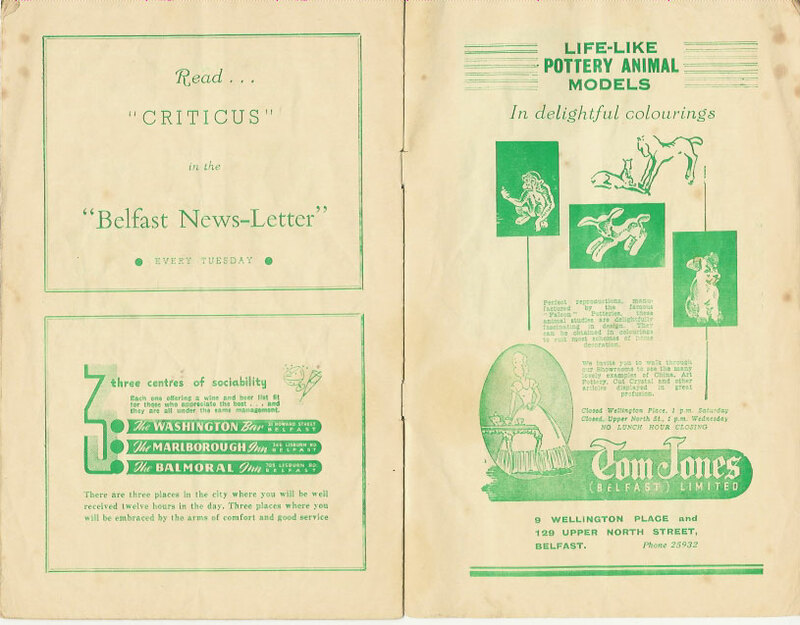 The owners, 'Fairflight Ltd' were found guilty on Nov 2nd 1950 of contravening the aircraft's certificate of worthiness and were fined £50 and ordered to pay £100 costs. Long may we remember the victims, all those they left behind and all those who tried to help them. ABERBEEG - IVOR JOHN JONES, WILLIAM HENRY JONES. ABERCARN - JOSEPH B. WATKINS, DOUGLAS BURNETT, MARK LEWIS, DONALD ROWLANDS, ALBERT S. ROBINS. CRUMLIN - RAY BOX . CWMBRAN - DAVID D. JONES, WILLIAM NICHOLAS, WILLIAM IRVING. CWMCARN - Miss KATHLEEN DAVIES. GARNDIFFAITH - RONALD JAMES PRICE. LLANTARNAM - ARTHUR.C. WILLIAMS, WILLIAM STEVENS, JOHN WILLIAMS, BERT JOHN BUTCHER. PONTYMISTER - ALAN BLIZZARD, NOEL GOODWIN. HERBERT RICHARD THOMAS, THOMAS JOHATHAN, DAVID PRITCHARD OWEN, DAVID A READ, HAROLD DUNSCOMBE, DAVID JOHN HAWKINS, LLEWELLYN JONATHAN, ROBERT JOHN E. THOMAS, LLOYD RICHARDS, ILLIAN HOWARD EVANS, DAVID HOPKINS, JOHN MASSON, JOHNNY READ, HYWEL HOPKINS, ROY MASSON, RICHARD J. BRADLEY, DAVID NELSON, HERBERT REES, WILLIAM BROOKS, IVOR OZLADE, U. PASCOE, WILLIAM COLES, SIDNEY HILL, WILLIAM ASH , BEATRICE MASSON, MARY THERESA HEGARTY, J.G.WALTERS, DAVID H. BURGESS, Mrs J. HAWKINS, WILLIAM BELSON, BARBARA THOMAS, WILMA JONES. The local history book 'Reflections of a bygone century' the upper Neath valley, states that three of the victims, Ms. Barbara Thomas was the daughter of the local landlord of, The Lamb and Flag Hotel in Glynneath and that her friend Wilma Nelson-Jones was at the time with her Grandfather, Mr. William Morgan Nelson. Barabra & Wilma are mentioned in the County of Glamorgan above although Mr. William Morgan Nelson seems not to be. We think that William Belson (listed as living in Glynneath) is probably a misprint in the newspaper report from which this information was obtained. ELWYN DAVIES, GOMER GRIFFITHS, WILLIAM A SCHOFIELD. BERNARD ANTHONY O'CARROLL, A.C. GRAHAM, Miss D. DAVIDSON , Signal-Captain (Pilot) D. J. PARSONS, JOHN ALEXANDER BERRY. 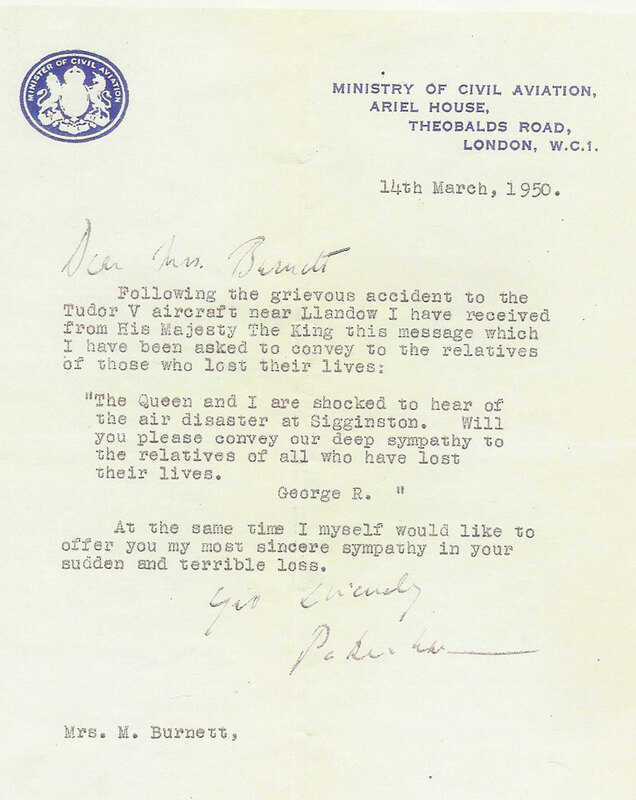 A letter of condolence from the Ministry of Civil Aviation in London with a message from his Majesty the King. This letter was sent to Mabel Burnett, the mother of Douglas Burnett of Abercarn. 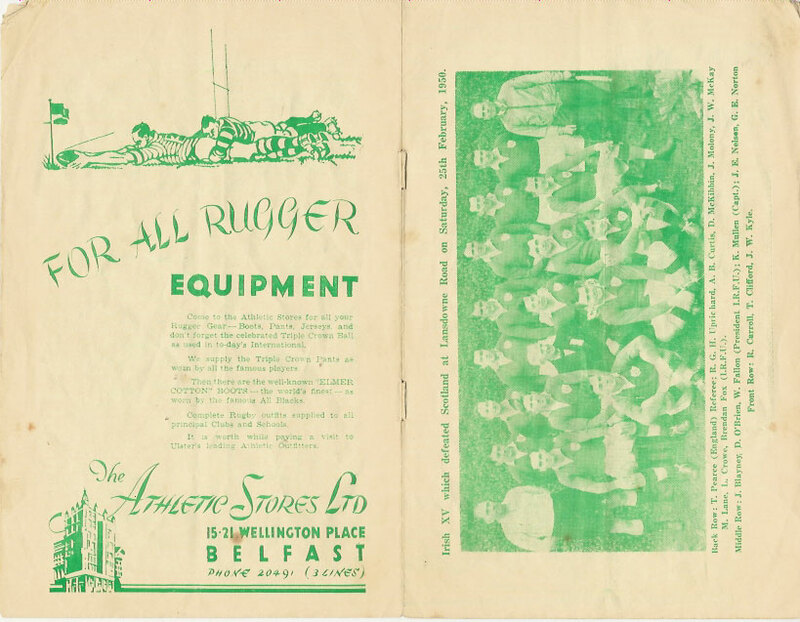 Six persons from Risca RFC were unfortunate to be on the fateful flight from Ireland. Three players – Alan Blizzard, Ivor Guy and Noel Goodwin. Also, three supporters of Risca RFC – Percy Jerman, Dr. Paterson** and Reg Beavis. At Risca RFC, there is a commemorative plaque in memory of the players of the club who lost their lives. "Dr Paterson was my grandfather although I never knew him as I was born in 1952. My mother swore she would never fly but did so to attend my wedding in Northern Ireland in 1979. My only other link to the story is that I was in school with the son of one of the survivors, Handel Rogers. My mother had been greatly shocked and saddened by her father's death and as a means of preserving the family name, at least for one generation, both my brother and I have the middle name Paterson." Thank you for visiting this page. If you are able to contribute any other stories, photos or information to this page, please CLICK HERE to email us.